If you are looking for an efficient grill that is easy to pack up but also makes your food taste good, look no further than the Weber Q2200. Weber a brand which is synonymous with grilling produced one of the best portable grills out there with this propane grill that gives you 12,000 BTUs and 280-square inches of cooking space, pretty much all you need to get the party started! 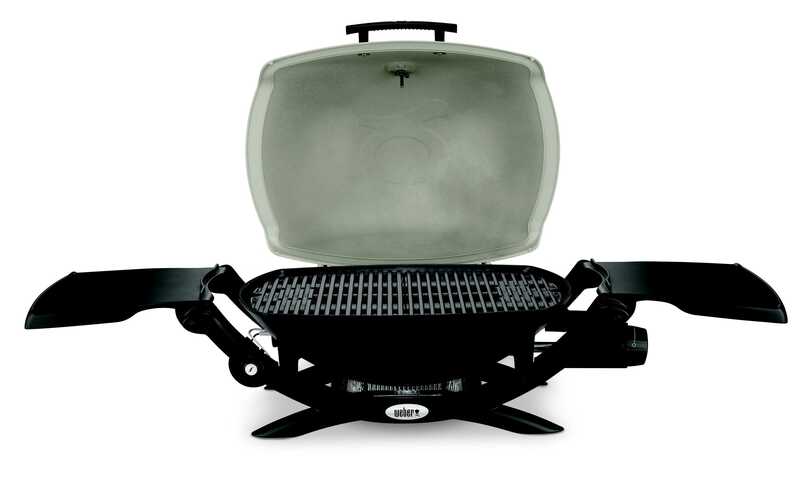 Take a look at the Top 10 Portable Gas Grills for more in this category. This little grill is built for travel with a collapsible design that folds to a compact size, with a large handle and wheels for pulling. It will fit into most car trunks and sets up in seconds. You’ll have 285 square inches of cooking space. The grill operates on propane, so there are no hot coals to worry about when cooking is done. This comes with porcelain coated cast iron grill grates, but griddle and stove grates are available, separately, to give you even more cooking options. Just push a button to start the grill. Two independent and adjustable burners 10,000 BTU burners let you cook at low and high heat at the same time. The porcelain coated surface is easy to keep clean, and the removable grease tray makes it easy to clean up when cooking is done. This uses 16.4-ounce propane cylinders. Solaire Anywhere Portable Infrared Gas Grill. Rasmussen Iron Works, Inc. Imagine the power of an infrared grill in a portable. This 14,000 BTU infrared grill packs more heat than any other portable grill and at 20 pounds you can take it almost anywhere. All stainless steel construction you can even get this grill in marine quality steel with a railing mount for boating. 155 square inches of grilling area. Uses either disposable propane bottles or can be converted to a full 20-pound tank or even natural gas. The TravelQ is a portable gas grill from Napoleon. Lightweight and very compact this 20-pound model can be carried with one hand, yet has plenty of grilling space on heavy cast iron cooking grates. In most ways, this is comparable with similar portables including heat output and capacity. One advantage this little grill has over many similar sized grills is the twin burner design allowing for greater versatility in cooking. While not inexpensive, this is a well-built portable that will work well at the park or on the beach. The telescoping stand makes it simple to set this grill high as a freestanding grill or low to cook on a tabletop. The 145-square inch cooking surface and 5,500 BTU stainless steel burner can cook for four to six people at once. The grates have a porcelain enameled surface for easy cleaning. The stand sets up and packs away in seconds, while the integrated lid lock keeps the grill secure in transport. The briefcase-style handle makes this easy to carry, and it weighs just 17 pounds. The Weber Kettle is the most widely identified charcoal grill and now the 18 1/2-inch Weber grill comes in a portable size. With the same cooking grate as the full sized charcoal grill, the Jumbo Joe is big enough for a full-sized cookout, in a portable container. Weighing 22 pounds and with a single hold handle, this just might be the perfect portable grill for when there are more than two people. This portable tabletop grill can go with you, wherever you go. You can use either charcoal briquettes or lump charcoal, and the 187 square inch cooking surface is large enough to hold six to eight burgers. The body of the grill is made from high-quality steel with a high-temperature finish ​and has chrome plated steel wire grates that are rust resistant and easy to keep clean. The handles are heat resistant. This folds up compactly with the legs securely on top of the grill, and it sets up easily when it’s time to grill. Cook-Air Wood Fired Portable Grill. Cata Marketing Inc. The problem with many portable grills is that they just can't produce a good, high grilling temperature. How about a wood-burning grill that can hit 1,000 degrees Fahrenheit? The Cook-Air grill uses an internal fan to create a cyclone of air moving over the burning wood to accelerate the combustion making it quite possibly the hottest portable grill on the market. Better yet, because it is a wood-burning grill, it makes wonderful amounts of smoke to flavor foods and actually makes them taste like cooking over a campfire, which you are. Loaded with great features and powered either by a standard outlet, car adapter, or batteries, this is a very portable little grill with a good sized grilling space. Perfect for tabletop grilling, or to take along for tailgating or camping, this compact grill has a removable ash pan that makes cleanup easy. It has 250 square inches of cooking space on cast iron grates that maintain even heat and produce professional grill marks. It’s made from durable, heavy-duty steel, and the handle stays cool during cooking, making transportation easy. If you decide that taking a grill on the road isn’t for you, this converts to a side fire box or Texas style smoker that fits several different Char-Griller grills, so it will be useful for years to come. However, once it’s attached to your grill, it can’t be removed. Our reviewers spent 12 hours testing one of the most popular portable grills on the market. To ensure the most thorough feedback possible, we asked our testers to consider the most important features when using this portable grill, including its footprint, fuel type, and various features. We've outlined the key takeaways here so that you, too, know what to look for when shopping. Size Yes, these grills are all portable, but that doesn’t mean they’ll all fit your transportation needs. If you’ll be tossing the grill in the back of a pickup truck, any of these models will work. But if you’ve got a conventional car, make sure the grill will fit your trunk’s unique size and shape. Fuel type Each fuel type has its advantages and disadvantages. You can probably find charcoal en route to your destination, while propane might take slightly longer to locate. 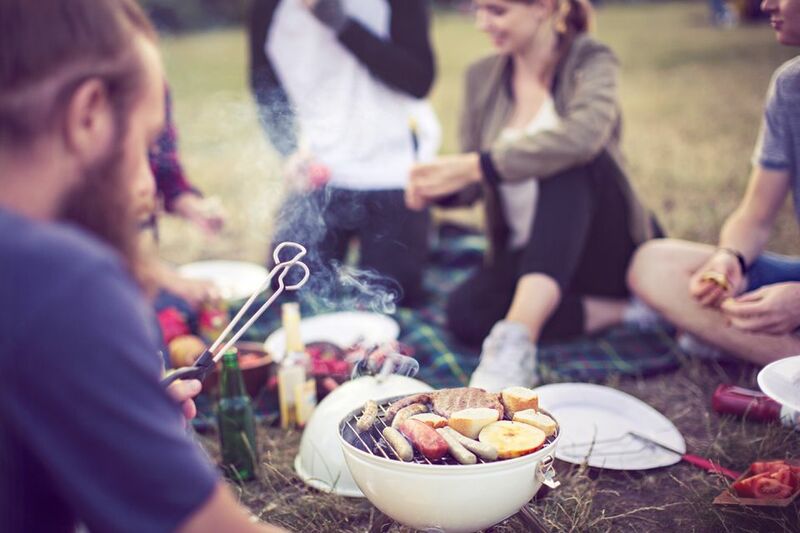 Electric grills don’t require you to make space for a heavy bag of charcoal, but you’re not likely to find an electric outlet at the beach. ﻿Cleaning If you’re going to be carrying your grill with you in the trunk of your car, how easy is it to pack it up when you’re done? Will you need to clean it thoroughly, or can you close it up and contain the mess until you get home? This portable grill won over our testers because it was easy to set up, carry, and wipe down. “It will officially replace my large gas grill that takes a lot of time to clean,” proclaimed one reviewer. Moreover, it was effective, with one tester noting that “the flame is strong, which helps the food cook faster.” However, one reviewer did wish that the grill came with a detachable stand so he didn’t have to place it directly on the ground or table.